« Peregrine nest disturbance: Can anyone recognise this individual asks the police? This season has been a catastrophy for rare breeding birds of prey on moorland in the Forest of Bowland, an area once regarded as a jewel in the crown for Hen Harriers and Peregrine falcons in Lancashire. Last September we learned about the curious disappearance of ‘Skye’ and ‘Hope’, the two Hen Harrier chicks which both vanished along with their state of art satellite tags after fledging from two nests on moorland owned by United Utilities; each harrier disappearing on two adjoining estates positioned just 2 miles from their respective natal nesting territories. It now appears the loss of Skye and Hope may have been all part of a well thought out new strategy implemented to cleanse moorland in northern England of all grouse predating raptors. This year we have seen this new policy put into practice for a second time with even more efficiency and devastating consequences for Hen Harriers than last year, resulting in the loss so far of 4 male Hen Harriers followed by the disappearance of 2 incubating female Harriers from nests in the Forest of Bowland. Taking into consideration the disappearances of the male and female Hen Harriers from the RSPB’s northern Pennine reserve at Geltsdale the maths equates to a total loss of ten Hen Harrier in just 9 months from two moorland locations in northern England. Bearing in mind the resulting collateral damage, we must also consider the loss of an average of 4 destroyed eggs from each of the 5 abandoned Harrier nests, that’s an additional twenty Hen Harrier chicks to be added to the ten missing adult Harriers. What is now crystal clear, who ever thought up this new and extremely effective Hen Harrier killing strategy certainly knew exactly what the results of their efforts would achieve, with little or no chance of anyone ever being apprehended for these crimes possibly undertaken several miles from any nest. If the individual/s behind this policy decide to carry on killing Hen Harriers and Peregrines on the same scale, then both species will almost certainly disappear completely from moorland where red grouse are shot in northern England very quickly. Last year we reported the loss at least fifteen Peregrine territories throughout the Forest of Bowland which had each been found abandoned since 2010, almost certainly the result of persecution. This year we are able to add 3 additional nesting sites to our list which failed this season. 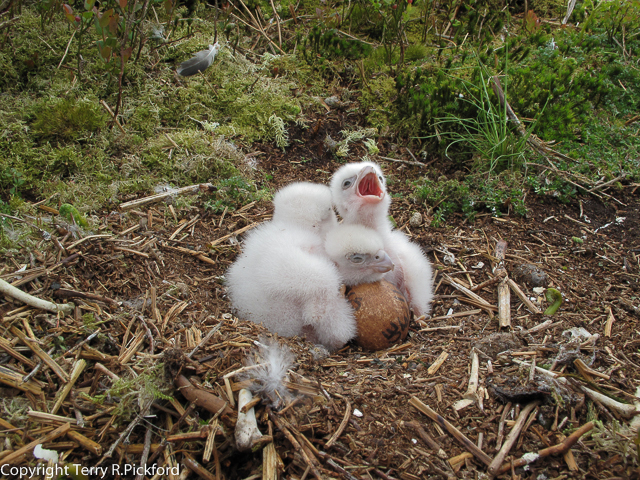 The single abandoned site located, which also failed last year at the egg incubation stage, was discovered in May by the North West Raptor Protection Group completely destroyed after rocks surrounding the nesting ledge were found at the bottom of the nesting cliff. 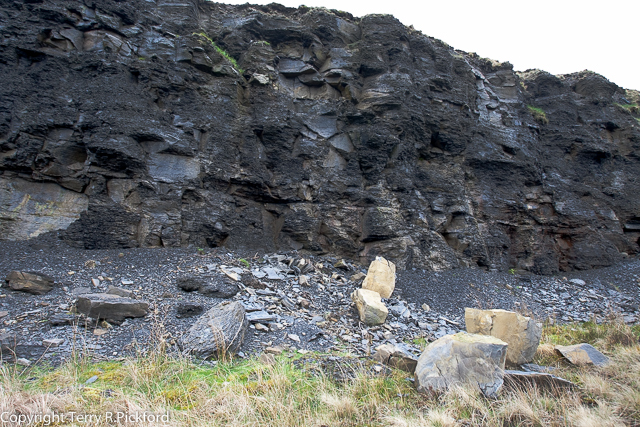 Since 2009 at least 4 additional historic Peregrine nesting sites in Bowland have each been destroyed using the same methodology rendering each site useless for any further breeding, such destruction undertaken out of the breeding season is legal. We have attached an image of the tons of fallen boulders discovered below the nesting cliff at the site destroyed this year; the breeding falcons were never seen again after the nesting site had been destroyed. 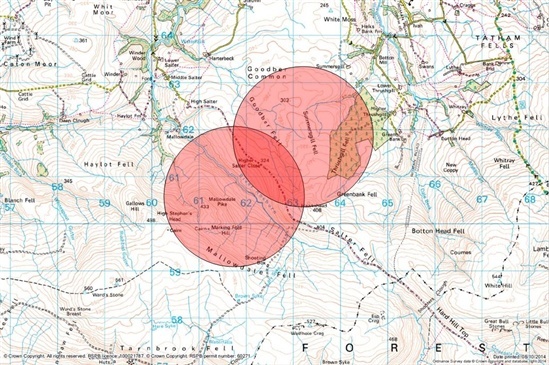 In 2009, twenty five Bowland peregrine territories were examined by members of the NWRPG. Seventeen territories were found occupied, 6 of these sites failed following the disappearance of eggs and chicks. A total of eleven territories were productive fledging twenty four young. This result was considered by the NWRPG to have been a very poor breeding season. The 2 larger female chicks vanished from this brood of 4 two days after the former Wildlife Crime Officer for Lancashire had invited gamekeepers, who were unaware of the nests existence on this particular estate, to come along and witness the ringing of the 4 chicks they were unaware of; coincidental, perhaps not? Ground nesting Peregrine nest found by the NWRPG in 2009, all 4 eggs hatched resulting in 2 female & 2 male chicks. The two larger female chicks vanished after all 4 chicks had been rung in the presence of gamekeepers. The 2 remaining male chicks just days after both female chicks had been removed by persons unknown from this nest. Although the 2009 peregrine figures recorded by the North West Raptor Protection Group were regarded as a very poor result, this years productivity for Peregrines in Bowland was a catastrophe, one of the worst seasons witnessed during the last thirty five years, with only two successful nests. 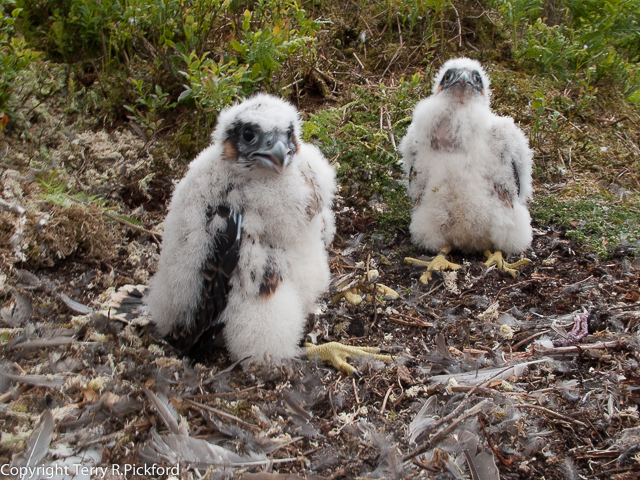 Of the 9 Bowland Peregrine territories which existed prior to 2009 on moorland owned by United Utilities, this season only a single pair of falcons succeeded in fledging any young at all. One additional Peregrine site established on a privately owned red grouse moor was also successful this year. There is more to learn about the Forest of Bowland, a very special part of the Lancashire countryside; apart from being an Area of Outstanding Natural Beauty, moorland throughout this region is protected by a Site of Special Scientific Interest classification (SSSi). In addition under the European Wild Birds Directive, Bowland’s moorland has also been designated a Special Protected Area (SPA), which in theory at least but not in practice, should provide vulnerable species such as the Hen Harrier and Peregrine with enhanced protection. As the Hen Harrier and Peregrines continue to disappear from red grouse moors, not only in the Forest of Bowland but also from a majority of northern England’s uplands where grouse are shot, important SPA legislation is being ignored by estate landowners as well as the Minister in charge of Defra and Natural England. The disappearance of the Hen Harrier and the Peregrine as breeding species is a prime example of how England’s moorlands are being mismanaged and legislation introduced to protect raptors completely disregarded. At the current rate of raptor losses taking place in the Forest of Bowland, there is a real danger Peregrines throughout this SPA and SSSi moorland region of Lancashire may become extinct as a successful breeding species almost at the same time as the Hen Harrier becomes extinct. What does this tell us about the feelings of estate owners and their gamekeepers towards birds of prey that have the nerve to predate their grouse? 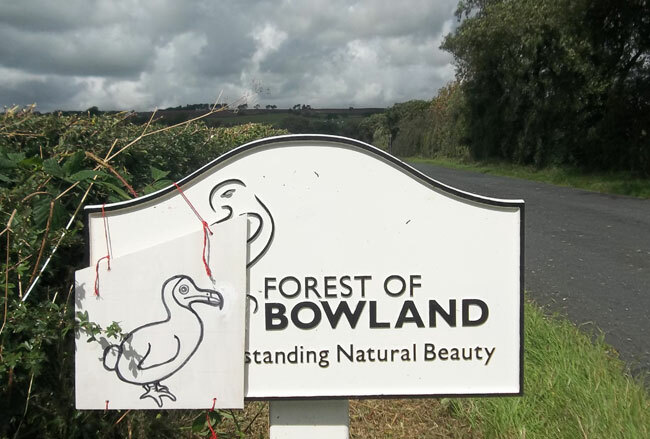 Will this be the most appropriate Logo for the Forest of Bowland’s AONB in the next few years? 5 comments to Disaster stalks the Forest of Bowland. Is this the beginning of the end for this ‘region’s’ ‘protected’ raptors. Whilst out in bowland last week I heard a terrible rumour if true that the 5th and last male hen harrier may have now also disappeared from bowland? Are you able to confirm this rumour? Editor’s Comment. No we are unable to confirm this rumour. We are sure the RSPB would have said something by now don’t you? However, if true this would be a disaster and very embarrassing. If we hear anything we will post online. It seems to me and no doubt many others that this is blatant bloody minded targeted killing of a protected raptor species, aimed specifically at proving to the RSPB and everyone else for that matter, that they can and will kill these birds as and when they please and there’s not a damned thing anyone can do about it. It’s obvious that someone high up is pulling the strings in the RSPB hierarchy to keep this information low profile, it’s also obvious they have full control over the police, the magistrates, the sheriffs and the judges, all of which have no doubt been told to do as they are told, (nod nod wink wink). As for the people in charge of running the United Utilities Bowland Estate, it seems they’re not really in charge at all !!! It’s high time the RSPB got a good kick up the backside to wake them up, they need to tell their members urgently the full unbiased truth about what’s really happening to our so-called protected birds of prey at the hands of the grouse shooting brigade on the estates, they have over one million members they could rally in support if only they would make the effort, unfortunately it seems they are too terrified of the shooting estate owners and would sooner cow-tow to them rather than take them on. Maybe the 2nd Hen Harrier Peaceful Protest at the Forest of Bowland, Lancashire, on the 9th August 2015 is a chance for them to show their mettle if they have any left. Use some of the money, (£30,000+) that was raised as reward for information re the Red Kite poisonings to advertise nation wide the full truth about raptor persecution on the shooting estates, (not that you need it with all the membership / donations money you already have at your disposal) !!! Agree if this bird has gone missing then there have been plans to kill all of these birds, are they trying to discredit the RSPB and prove they can’t protect these birds so they can bring their meddling HH recovery plan in. Someone is orchestrating these killings maybe to prove they are untouchable. Yes RSPB use the money that I contributed to, to put a campaign in place. Let’s catch these murderers, because there is no way on earth these five have disappeared due to natural causes. This is horrible. Why would anybody want to kill such beautiful birds that are only doing what they can to feed their remaining chicks. These people need to be found and stopped immediately! All those birds. What a massive loss, and if these hunters believe murdering the chicks would be a good place to start they are wrong.